The way to a guest’s heart at any successful event is serving delicious food. Remove the stress of trying to meet this goal by hiring a professional catering company. In New Mexico, you’ll find caterers offering a wide selection with varying styles to suit any brand of event. With a commitment to providing only the best, here are the 10 best caterers in the state. 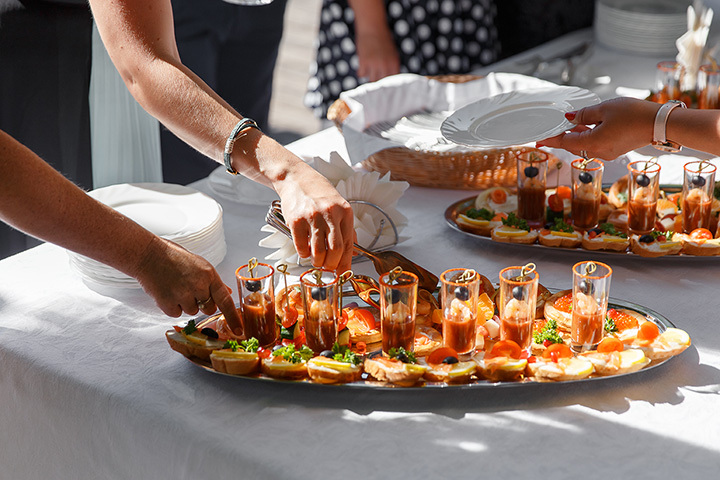 From barbecue to black-tie dinner and all celebrations in between, this full-service caterer provides first-rate food, great service and beautiful accoutrements to make every event spectacular. The chefs use the freshest, local ingredients that capture the season of your event. You decide the menu highlights and the chefs take it from there. Whether you’re planning a wedding, corporate affair or a neighborhood luau, you’ll find everything you need from meeting and event planning, floral arranging, linen services and all the trapping that come with making an event successful. This is a one-stop shop for all your event or celebration needs. The menu choices are extensive. Choose from breakfast, brunch, box lunches, soup, hors d’oeuvres, dips and spreads, platters, entrees and desserts or mix-and-match for a unique experience. The team at this family-owned and operated business can help with planning and set-up or you can do it all yourself. Everything is made from scratch with the best of seasonal ingredients. If you don’t see something on the menu, they’ll even make that for you. Doin’ it Casa Nova style is a well-known phrase in the world of event planning in this city. For good reason. The elegance and stylish simplicity that comes with engaging this caterer is indeed distinctive. Menus are custom designed to insure a unique experience. Choose from plated or buffet style service, and there are vegan, gluten-free, vegetarian, and soy-free options. From set-up to clean-up, every detail of your celebration will be scripted and executed with seamless, graceful, unobtrusive style. Diane is the founder, a mother, a baker and the creative genius behind the eclectic cuisine here. A baker for more than 30 years, you won’t find better breads and pastries—an event serving only these would be a delicious menu. She does much more, of course. She is at ease catering weddings, reunions, business gatherings, parties, conventions, meetings, funerals, birthdays or quinceañeras and can provide a menu to suit each. All food, from salad dressings to pie, is made in house with the best of the season. If you want a spectacular centerpiece, be sure to order one of her fabulous cakes. Owner PeeWee has been a part of the Gallup area food scene since 1982. What began as a delivery service of her homemade banana bread and pies throughout the reservation morphed over the years into a full-service restaurant and catering company. She’s still making pastries and now is known for her plate-sized cinnamon rolls. The catering menus provide options for snacks and hors d’oeuvres, breakfast, lunch and dinner and, of course, desserts. Menus are varied and comprehensive. Free delivery, set-up and service are part of any celebration. This chefs at this eclectic restaurant serve a dual purpose: they are the heart-and-soul of the restaurant as well as the creative team behind a well-respected catering service. The restaurant menu of fresh made appetizers, soups, sandwiches, salads, desserts and pastas, steak and chicken dishes is just a starting point for any celebratory occasion. This is a full-service caterer so if you don’t see something you like on the menu, ask them to make-it-to-order and they won’t disappoint. Traditional New Mexican fare prepared in a traditional way is the focus of this family-owned restaurant and catering service. For more than 25 years, these family chefs have highlighted a blend of time-honored Mexican food complemented by Native American influences on their menus. If you’re looking for an authentic taste of the Southwest for a celebration or event, you will not find a better option. The menu includes favorites like stuffed sopapillas, pollo verde, fajitas, chile rellenos, as well as enchiladas, tacos and tamales. If you’re looking for a one-of-a-kind experience for an upcoming function, what you’ll get here is a beautiful venue, tasty and flavorful food and an uplifting feeling that comes from supporting this extraordinary nonprofit. On-site venues include The Lakeside Dining Room, Dining Room and Canopy Courtyard, Library and Library Courtyard and actual shoreline access at their own Swan Lake. Catering and culinary arts are two of the vocational skills taught here. All food is made in the kitchen on the premises. Let them coordinate all aspects of your function—that’s what they’re being taught to do. Not only does the family who owns this restaurant want to feed you, they want to feed all of your friends, too. This is old-fashioned bar-b-que; meat is slow-cooked over pecan wood. Sauce, salads and beans are made fresh daily. The catering menu is buffet-style. Choose a meat, like brisket, smoked ham or spicy hot links and then add a home-style side of potato or macaroni salad, beans or coleslaw. Rolls and sauce are included. Be sure to order the homemade sourdough cobbler, a recipe straight off the chuckwagon. The goal of the catering staff here is to make entertaining easy and relaxing for all customers. To that end, they create party platters and casseroles you can pick-up or have delivered. Host a buffet lunch or dinner that includes an appetizer, entree and side dish ready for serving. Or, order a diverse selection of appetizers just right for a finger-food party. If you need help, they’ll take care of your entire event … how’s that for easy and relaxing!